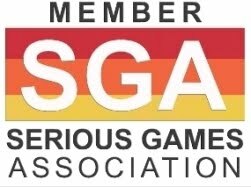 Global Kids and the MacArthur Foundation have partnered to announce a new nonprofit and philanthropic theme for the third annual Second Life Community Convention (SLCC), to be held August 24-26 in Chicago (please find my prior posting Upcoming Serious Games Events "Check-In" ). The funder behind the effort is the John D. and Catherine T. MacArthur Foundation, which views the new SLCC work as one of the next steps in the Foundation's year-long exploration of the role of philanthropy in virtual worlds. The new focus for SLCC builds on Global Kids' path-breaking educational programming in that environment. * Education keynote Connie Yowell, Director of Education at the MacArthur Foundation, will address the importance of virtual worlds for informal learning and its nonprofits. * Philanthropy funders, including foundation, corporate and government organizations who are supporting work in virtual worlds, such as the MacArthur Foundation and Learn and Serve America, will discuss the role of philanthropy in virtual worlds. * A panel on Best Practices in Bringing Non-profits into Second Life including such organizations as the University of Southern California, UNICEF, the United States Holocaust Memorial Museum, Idealist.org and TechSoup. * A teen-led mini-machinima festival, in which teens from two non-profit programs will showcase their work using Second Life to make animated movies about social and global issues. * An Educational Non-profit's History of the Teen Grid: Global Kids' Adventure in Best Practices. Following SLCC, two papers will be developed by Global Kids. The first will analyze the education track and be titled The Virtual Worlds for Learning Roadmap, while the second will analyze the non-profit thread. The John D. and Catherine T. MacArthur Foundation is a private, independent grant making institution dedicated to helping groups and individuals foster lasting improvement in the human condition. MacArthur's $50 million digital media and learning initiative aims to help determine how digital technologies are changing the way young people learn, play, socialize, and participate in civic life. 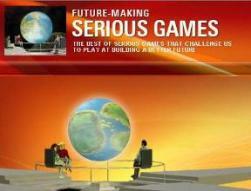 Global Kids is a world leader in using virtual worlds for education. Over the past year and a half, with the generous support of the John D. and Catherine T. MacArthur Foundation, Global Kids has received national recognition for its innovative use of virtual worlds for education about global issues and civic engagement. 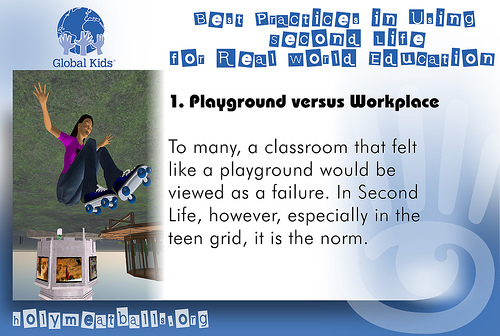 In February 2006, Global Kids launched GK Island, becoming the first non-profit to build land within the Teen Second Life grid. Since then, Global Kids has used Teen Second Life to solicit essays on young people's relationship with digital media; conducted an intensive summer camp in which youth learned about and took action on critical global issues; organized a collaborative program with UNICEF to educate youth about an international agreement, A World Fit for Children; brought in guest speakers, such as Mia Farrow discussing the genocide in Darfur; and involved youth in ongoing leadership development programming. 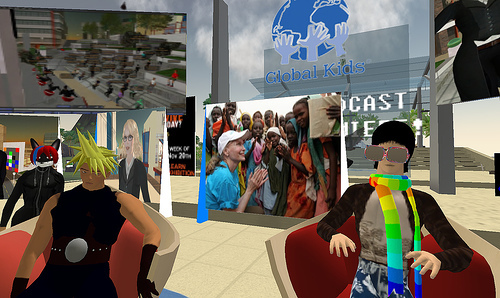 Global Kids work in Second Life builds upon its more than 15 years of experience in youth leadership development and international affairs education, as well as its role as a national leader in using serious online games for educational purposes. 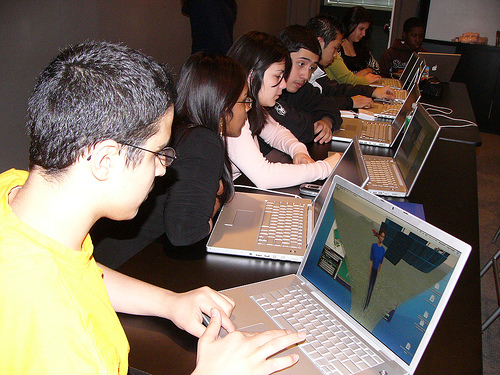 "Global Kids' Second Life programs offer young people a world in which their characters can take part in myriad workshops and games that educate them about major world issues and events, from the International Criminal Court to global warming and child labor," says Carole Artigiani, Global Kids Executive Director. "Players learn how to communicate, collaborate, negotiate, and mobilize their peers for social change. We are excited to organize this component of the conference and bring greater attention to the potential that virtual worlds hold for the nonprofit community as a whole." Global Kids' Online Leadership Program, now in its sixth year, integrates the use of the Internet into GK's leadership development and international affairs programming. The OLP equips youth with the skills necessary to use the Internet as a tool for research and social change and develops online resources for educators and young people to promote civic engagement and global literacy. Currently, the OLP is accomplishing these goals through initiatives within two broad areas: youth-led online dialogues and the development of socially-conscious games. The OLP has built strong collaborative relationships with Microsoft, the NewsHour with Jim Lehrer and the game design company gameLab, among others.